So you purchased the perfect mini for your character, but it is currently just a heap of white metal in a plastic blister pack. Oh, and it uses a scimitar instead of that awesome two-handed falchion your character likes to use to split enemies in twain, but it is close enough to perfect… and you can literally picture what it will look like painted and finished in your head. However, a day and a few paint pots later, your miniature figurine doesn’t even come close to what you wanted. This is probably a familiar scenario for many roleplayers who try their hand at trying to find and paint the perfect miniature. Well today, as part of my series of miniature resources, I am presenting a database of websites that offer tutorials to level up your miniature hobby skills. The following collection of sites has been tagged with what types of help they offer. Typical examples include painting tips & tricks (like how to paint non-metallic metal), basing (make your mini look like it’s standing on terrain), photography (how to grab an awesome pic of your finished masterpiece), sculpting & conversion (make your own mini or modify an existing one), casting (mass produce a custom mini), and terrain (creature awesome environments to use your mini with). Scroll right to see the URLs. 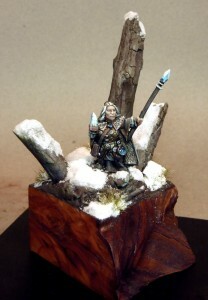 I would also like to add that The Miniatures Page (http://theminiaturespage.com/) is the premier place to get advice on just about any aspect of miniatures. It covers the full gamut with forums on all types of mini gaming and there are plenty of tutorial type posts. .-= Chgowiz´s last blog ..Better mini pics =-. @Chris: Hmmm… I never thought about a “field test” category (most likely because this is directed primarily at roleplayers). I might have to begin adding resources for such a category. @Chgowiz: Hahaha. I actually have The Miniatures Page on there, but had it bookmarked for scales… going to re-arrange things. Also check out my buddy Jamie’s gaming/painting blog at http://warpainter.wordpress.com/ for some good painting info as well as how the models did on the field!